The ?Bhairav Se Bhairavi Tak? series presents the recording of the thematic concert held on 2nd and 3rd October 2010 at Bal Shikshan Auditorium, Pune. This journey through Ragas was presented live by the musical greats ?Padmabhushan Pt. 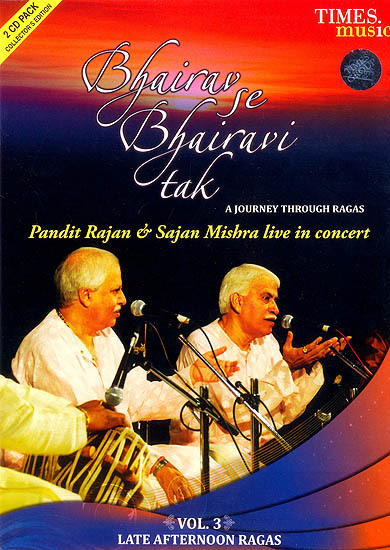 Rajan and Sajan Mishra ? in four sessions from morning till night. Indian classical music is well defined and its correlation with time, space and season is well established? In the 24 hours of the day cycle, Ragas are connected with specific time zones from Dawn to Dusk and further into the night. The entire day is divided into different ?Prahar?s (time zones) that evoke certain emotions or feelings which get reflected through different Ragas and their set of musical notes. ?Bhairav Se Bhairavi Tak? was a unique and challenging musical concept to perform. Padmabhushan Pt. Rajan and Pt. Sanjan Mishra from the most ancient Benaras Gharana of Indian Classical Music took up this challenging concept and presented this great heritage of music in two days in four sessions in Pune on 2nd and 3rd October 2010. This album is the live recording of this unique concert where the two brothers performed various Ragas from the early morning Bhairav to the concluding Bhairavi, talked about their musical training and shared their thoughts. Times Music and Creative Media and Management Services join hands in presenting to you this amazing and rare concert recording in four volumes.